Yesterday I finished my bead painting and then I went and did my posting on this blog. Then I got surfing the web, jumping from one fabulous artist site to the next. 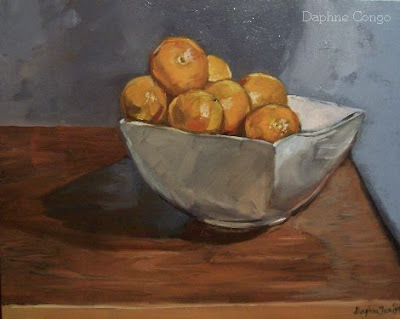 I was so inspired that as soon as I put my kids to bed I went into my studio and painted the above painting of oranges. They have been taunting me to paint them ever since I did that drawing in my sketchbook (see previous post where I posted the drawing) this past weekend. I find the internet a great tool to get inspiration. I find it just as good as art books, just less tactile. Though, I do find books easier to keep track of than websites. There maybe hope for me because I just started using 'my favorites' feature in my web browser to help me keep track of artist websites and blogs. I highly recommend taking a dreary afternoon and looking at some art online. You may truly be amazed at what is out there.